Historians tell us that humans have been mixing medicinal tonics for ages—and trying to get past their intrinsic bitterness for just as long. This age-old interest in making medicines palatable is one of the things that led to the mixture of bitters into a glass of sweetened brandy or whiskey. Generally speaking, cocktail makers have settled on no more than a dash or two of bitters—like salt in cooking, the bitters in cocktails are usually applied at subliminal levels that accentuate, complement and blend the flavors of our drinks. But there are a few throwbacks, which brings us to Leo Engel’s Alabazam. Subtlety is not in Alabazam’s repertoire. With Alabazam, bitters are front and center. The formula goes back at least to 1878, when Engel published American and Other Drinks . 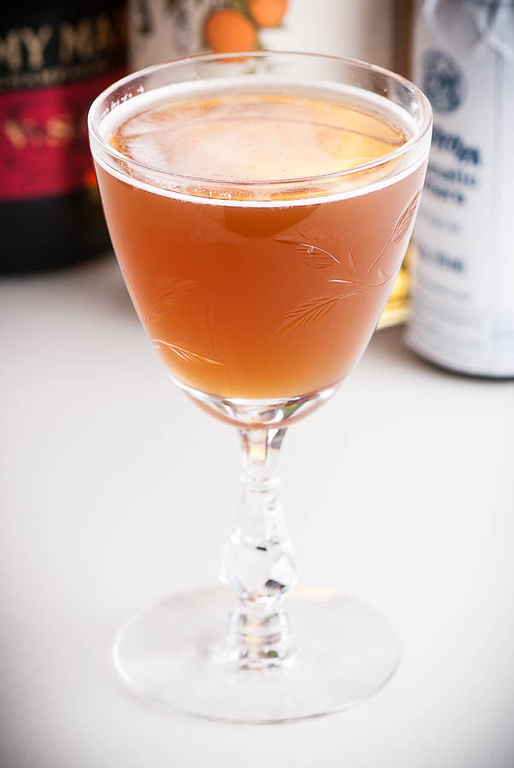 Alabazam, as he describes it, is a small, darkly bitters-heavy brandy sour. It’s an interesting experiment, but may not have caught on the way Engel hoped. In fact, it appears that the post-Civil War drinking public was already of two minds about bitters, since only a few years later, William Schmidt published a version of Alabazam in The Flowing Bowl that didn’t just cut back the bitters, but was entirely bitters-free. It was a harbinger of things to come; for the next hundred years, cocktail drinkers (and their bartenders) would progressively banish bitters from one classic cocktail after another. Hard times for the Manhattan and the Martini. I consider myself fortunate to live in a time when bitters have worked their way back into the repertoire—and back into the Alabazam. A typical, “evolved” 21st-century Alabazam recipe includes the conventional, non-assertive “2 dashes” of bitters, as in this one from Dale DeGroff’s Craft of the Cocktail. Shake all ingredients except soda water with ice; serve in a tall glass with ice. Top with soda and stir. It’s a good cocktail, but it lacks the spicy complexity of the original. I recommend that you try this version if bitters don’t suit your palate. DeGroff’s presentation, a tall glass topped with soda, is interesting. Engel’s listing makes no mention of soda, and is served in a stemmed glass. DeGroff version of Alabazam is a tall, iced, fizzy drink. Engel’s original Alabazam was more sedate, a dark spice bomb. That’s a lot less lemon than DeGroff’s, and a lot more bitters. That “half a wine glass” was probably about one ounce of brandy. The teaspoon? Historians tell us it could have been the modern ⅙ ounce, but could also have been as much as ¼ ounce—50% larger. I found that the modern ⅙ ounce seems to achieve the right balance, at least for my taste. Despite what appears to be an outrageous dose of bitters, the flavors of this version mesh very happily. The nose is nearly all about the bitters—both spicy and fruity, with bark, cinnamon and some of the citrus coming to the fore. 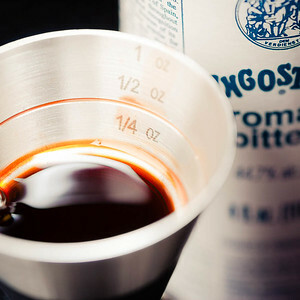 On the tongue, the more earthy and bitter aspects of the Angostura come through, and still dominate the drink, but the long flavors are more about the lemon and brandy. The balance is directly affected by your choice of bitters, of course. Engel actually specifies Angostura, and his choice is a good one. But I can tell you from experience that the Alabazam is a natural playground for aromatic bitters. If you’ve got ’em, flaunt ’em; you’ll get away with it here. I substitute simple syrup for the original straight sugar. I don’t think the slight extra dilution from the water in the syrup changes the drink. I like the Ferrand Dry Curaçao, but the Cognac-based Grand Marnier would be a fine alternative. The revelation for me is that brandy and Angostura bitters seem to be made for each other, the brandy masking the bitterness of the Angostura, and the bitters tempering the fruitiness of the brandy. This cocktail is all about spices. Try this: make the Alabazam, sit quietly, and breathe with it. So much spice, so much complexity. I have no idea what all those scents are, or even how to separate them. How many names can you attach to what you’re breathing? We live in a bountiful world. “Bitters and Brandy—the Alabazam Cocktail” at cold-glass.com : All text and photos © 2014 Douglas M. Ford. All rights reserved. Very nice. Personally I love cocktails with a large dose of bitters. One of my favorites, Angostura Fizz contains an entire ounce!. I made this first Alabazam tonight with Fee Bros Old Time Aromatic, Maison Rouge VSOP Cognac (my house mixing cognac), and Marie Brizard orange curacao. I’m going to switch it up a bit for my next one. I haven’t been able to get my hands on the Ferrand dry curacao yet but it’s at the top of my list. I’ve seen the Angostura Fizz, never tried it. Your comment will motivate me, thanks! Delicious! I substituted 1/4oz of 2:1 demerara syrup for the simple syrup, seemed to work very well. Also used Gran Marnier instead of Ferrand. Demerara would be great in the Alabazam, good idea. Thanks for posting! Having a penchant for bitters myself, I really do love this one.